Known as Australia's most Northern speedway and in a town that survives on the mining industry, It was the mining company who gave something back to the community, In 1976, a group of people got together and decided it was time Weipa had its own speedway. The group aquired some land near the airport in an area that wouldn't create a noise problem for the townsfolk, The original track was 1.6km in length but was later rebuilt and resized to a respectable one third miler. Bill Johnson, one of the original group, was employed by Camalco to teach local Aboriginals how to drive mining equipment, needless to say, Bill had just the training ground, with Mining machines and Camalco employees the track was constructed in no time at all. The very first meeting was held with just four cars, Stuart Baird, Bill Johnston, Ron Geary and John Vanderheuval. By 1978 they had grown to 18 cars and had also incorporated Motorcycle racing into the programme, At the end of 1978 the track was resized yet again, this time reduced to the more accepted quarter mile circumferance, which in turn attracted the attension of the formular 500 competitors. In 1985 Weipa changed again back to the earlier one-third mile concept, but this time, the speedway went under lights for the first time. Australia's Most Northern Speedway was playing in the big league, It was this season that Weipa had the honour of hosting the Queensland Formula 500 Championship, this event became even sweeter when local driver Ray Barber won the championship. By 1997, Dirt Karts and Bombers were a major attraction on the Speedway Programme. 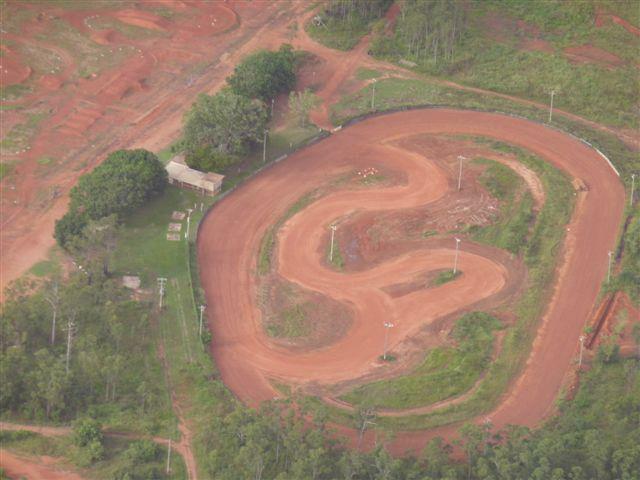 The Weipa Dirt Kart Club currently conducts Speedway Dirt Kart racing on a 450 metre short coarse circuit on and inside of the Speedway track.